So, of course I had to get mine out and play some more! I hadn't used the snow couple, and figured this was the perfect time to show the couple some love, and play with the new Be Mine Stitched Framelits coming next month at the same time. The die cut snowflakes are from the Blizzard Thinlits Die, which is also retiring and is now discounted! If you didn't get the Snowfall Thinlits that were only available last month, now is the perfect time to get flaky! As always, the discounted items are while supplies last, and are sure to sell out before the sales period ends. To see the list of retiring/discounted items CLICK HERE. 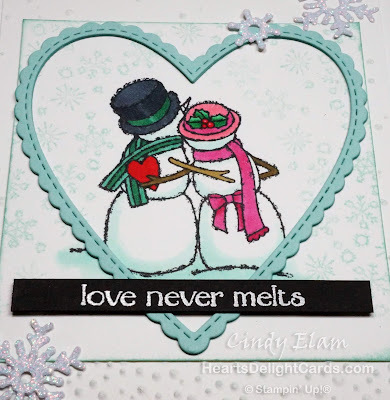 Labels: 2019 Holiday Retiring List, Heart's Delight Cards, Spirited Snowmen, Stampin' Up!